Home > 2016 > 01/24 > Is Jiri Hudler a perimeter player? 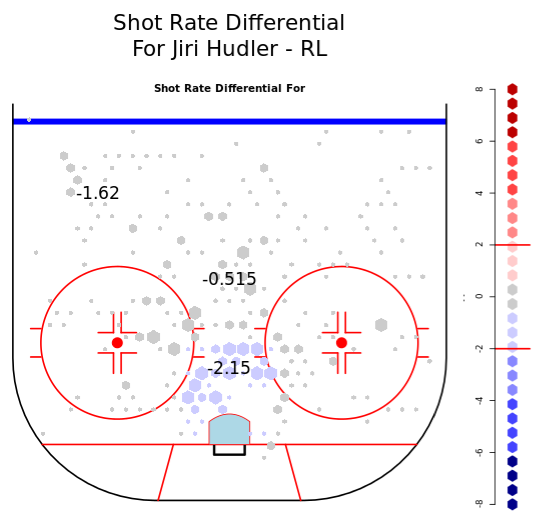 Is Jiri Hudler a perimeter player? For the visual learners in the audience, I have a few nifty charts for you. First, from our friends at Sporting Charts, the heat charts for Hudler’s even-strength shooting this season and last season. Redder and yellower means he shot from there more frequently. As you can see, he’s barely getting into the slot to shoot this season. And for giggles, here’s something similar from our friends at War-On-Ice. Rather than looking at his own frequency, this is a look at how often Hudler shoots from the various areas of the ice relative to the league average. What do these charts tell us? Hudler’s shooting less often from every area of the ice relative to the league than he was last year, but there’s a notable massive correction in how often he shoots from the slot. And all the charts taken together say that he’s shooting less often and when he does it’s from the lower-percentage parts of the ice. For comparison’s sake, he had 158 shots last season (2.02 per game) in all situations and this season he’s averaging 1.45 per game. Before we dive in, some definitions. Scoring Chances: Only some shot attempts from the periphery, most shot attempts from the mid-areas, and all shots attempts from the slot. High-Danger Scoring Chances: Any shot attempt from the slot. This season, Hudler is the 12th-best Flame in terms of all Scoring Chances (behind nine forwards, plus Giordano and Hamilton) and he’s the 10th-best Flame in terms of High-Danger Chances. Last season, by the same measures, he was third in Scoring Chances (behind just Gaudreau and Monahan) and fifth in High-Danger Chances (behind Gaudreau, Monahan, Jones and Bouma). So not only is he sticking far to the outside in terms of shots and scoring chances relative to the league, he’s doing so relative to the team, too, so any defenses of “Oh, but the whole team is a bit worse!” are flat-out wrong. 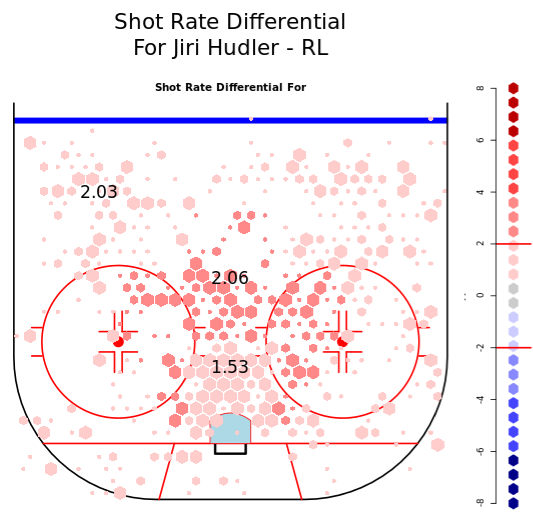 Why is Jiri Hudler’s shooting percentage so much worse than last season? Because he’s a perimeter player. He’s shooting a lot less than last season, and when he does he’s staying to the outside so the shots are a lot less likely to go in. The beating he took from RR last year showed his weakness then he became ineffective. My thoughts are, he has lost confidence to go into those areas as well as other defence men know how to play him. The flames are not under anyone’s radar, teams look to shut down the top line. Hopefully with our second line going good now maybe the focused wont just be on the top line. This might allow Jiri to help the top line out build his confidence up and as CP said maybe we can some value at the TDL. I don’t believe he has the intestinal fortitude to be a key piece going foreward. This was really good Ryan. Jiri never shoots comparatively because he never has the puck this season. As soon as he has it, he’s distributing it. Yes it is a quandary. Now that Hudler has crapped the bed in a contract year, do the Flames take advantage and sign him at a discount, trade him, or simply let him walk? But the more important question is why? How do you go from what he was last year to this? Many have speculated about the RR hit from game 81 last year, to maybe there is an underlying nagging injury which even further hinders his skill set, to personal issues to who knows what. Maybe the flames need to bring a hypnotist to get him back to playing the way he did last year. The other question is how far away is he from his average seasons? Are we expecting too much from him; last year being the exception not the rule for him. Remember Cammi was not exactly lighting it up before the trade deadline 2 years ago and then suddenly he got it going. Also can anyone tell me how Hudler’s season broke down last year, did he not go on a run in the second half last year? What we have to hope is that he shows enough between now and the trade deadline that we can move him for prospects or a decent draft pick or part of a meaningful deal. Yea, knowing why he’s a “perimeter player” this year and taken such a huge step back from last year would be most interesting. We all know last year was a career year for him and it had to do with playing with Johnny and Sean, but this isn’t a regression to his mean as far as his shooting goes. It’s below that. I’m in the “lingering injury” camp. Does shoving a ref (like Kassian’s shoving of the official last night) get an automatic suspension? Not the same player. Skating, shot…everything is off this year. If it’s not injury, I’m stumped. He was infinitely better last year. hey stats nerds….is there an easy way to find out how many of Hudler’s goals from last season had a first Assist with Johnny’s name on it? Brings me to another thought, as others have mentioned. Yes, Johnny is a stats bumper. You are better off playing with him then without, so when do we try Mony without Johnny? Otherwise, do we really know what we are getting into when we go to negotiate that contract? I’d like to see him on a line with Frolik for a good 20 games or so. I think he could learn a lot from that experience and so could we. These are ail good points. I would go as far as to say that Johnny likely built unreasonable expectations for ex college linemates like Hayes in the NHL. I think you are correct. Furthermore, I think Hudler benefitted from being on Johnny’s line when he was still an unknown commodity. Teams didn’t know what to expect like they do now and as a result it’s become increasingly important that his line have a RW who can cause a little havoc and win some board battles. It actually baffled me how long the top line lasted with Hudler at RW. the line was surprisingly soft along the walls but still got all those points. I don’t think that will happen the same way again now that the NHL knows Johnny Hockey. As I was out walking the dog(intentional play on words) I was thinking about Hudler and I began thinking about Smid injury last year and was wondering if Jiri has an underlying injury that we are unaware of. Maybe like Smid last year he is trying to play through something and might be better off getting it dealt with. I for one thought Smid was done yet I have been happily surprised by his game most nights. He’s hurting, and he’s playing himself into a KHL contract next season. If the Flames know what’s ailing him they must be hoping it’s nothing permanent and they’re looking for a discount, short term re-sign for next year. If he doesn’t heal up and rebound soon , he’ll be on the outside (KHL)looking in. Darn shame. My takeaway from this? Sam Bennett is a scoring chance machine.